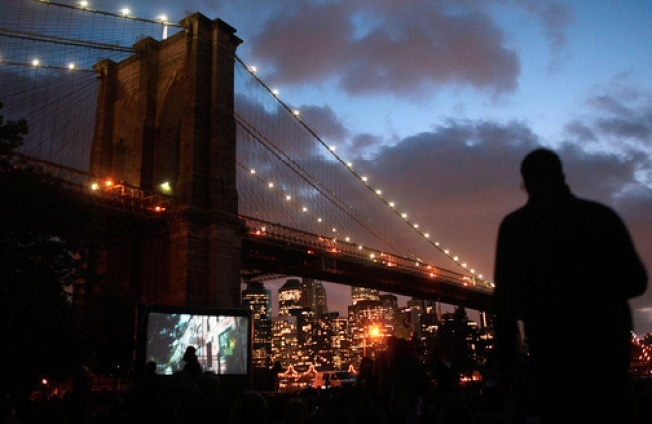 Movies return to Brooklyn Bridge Park tonight with Annie Hall. CLASSIC: Brooklyn Bridge Park’s Thursday night Movies With a View screening series returns with one of the New Yorkiest films of all time: Woody Allen’s Annie Hall, aka the film that birthed the romantic comedy as we know it (chatty, neurotic, winning). Ursula 1000 will DJ in the leadup to the movie at sundown. DOWN HOME: “Roots rocker” Steve Earle and country-folk singer-songwriter Alison Moore kick off a four-week residency at City Winery, and they’re inviting some of their friends along. Tonight, they’re joined by the moving hush-and-twang of Roseanne Cash. 9PM. PLUS MINUS: In case oppressive heat makes you crave creatively wacked-out time signatures, Seattle-birthed experimental rockers Minus the Bear set Webster Hall ablaze tonight.6PM. NOSH: The World Financial Center puts on its EAT Restaurant Showcase, when the complex’s food purveyors dish out tastings of menu items for (usually) less than a fiver. We’ll be checking out Donald Sacks’ crab cake sliders, that’s for sure. Wash it all down with live entertainment (well, and drinks, too).